JRRshop.com | Mogami Pure Patch PR Hi-Definition Patch Cable - 15ft. Mogami Pure Patch PR Hi-Definition Patch Cable - 15ft. This Mogami PR Pure-Patch TS 1/4" Male to RCA Male Patch Cable is a patch cable that exceeds all industry standard audio and video specifications for performance and reliability. Neglex OFC #2964 cabling is used for clarity and freedom from noise and RF interference. 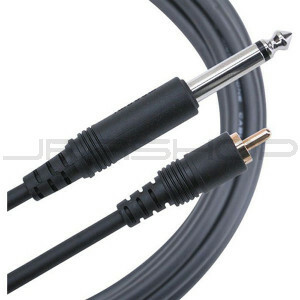 This cable uses an improved double mold design for the 1/4" plug connection on one end, and a gold plated RCA plug on the other. Its improved strain relief design offers better strength, durability, and longer flex life. This cable's extremely low-capacitance and cross-linked cellular polyethylene dielectric delivers superb noise rejection while maintaining amazing clarity. Its 75 ohm coaxial design is impedance matched for video and digital audio transmission.